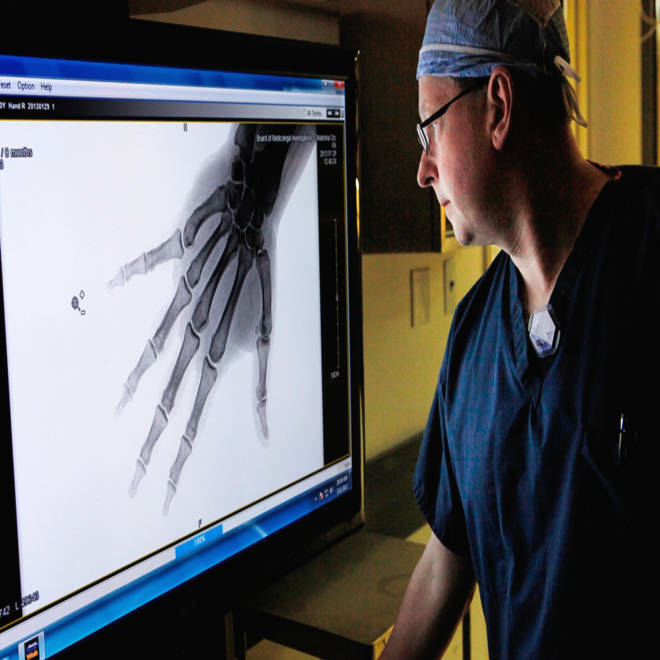 Oklahoma's Chief Medical Examiner Eric Pfeifer, seen here looking at an X-ray on March 21, said the toll from the tornado was "horrific." Even to a man who deals in death every day, the toll from Monday's tornado was "horrific." That was the word Dr. Eric Pfeifer, the chief medical examiner of Oklahoma, used Wednesday to describe the challenge of identifying and performing autopsies on two dozen victims. After working around the clock for two days, Pfeifer emerged from the morgue exhausted, his voice hoarse, but full of praise for an overburdened staff that pulled together "to get this sad job done." This week's disaster was not the first time Pfeifer had been confronted with nature's wrath. He had been on the job for just a few days when a twister tore across the station in the spring of 2011, killing 10 people. "I can remember him saying that he had not ever had any cases just like that," recalled Doug Stewart, a University of Oklahoma pediatrician who sits on the board that brought Pfeifer from Minnesota to run the Sooner State's once-troubled M.E. 's office, based in Oklahoma City. This week's storm was far worse. Less than 48 hours after the funnel cloud hit, though, Pfeifer's office had determined a cause of death for every victim, identified all of them and notified their families. Members of his board of directors said such efficiency would have been hard to come by in the years before his arrival, when a backlog of unfinished cases hit 1,500 and the office lost its national accreditation. "We were in a crisis when we hired Dr. Pfeifer," said Chris Ferguson of the Oklahoma Funeral Board. "But he seems to me to be a crisis manager." Before coming to Oklahoma City, Pfeifer was a medical examiner at the Mayo Clinic and a coroner for Olmsted County, Minn. He was taking over an office that was underfunded, understaffed and filled with equipment "out of the 70s," Ferguson said. "I knew what I was getting myself into when I accepted the Chief ME position here and have focused the last two years on campaigning for resources to rebuild this once esteemed practice as well as remaining actively engaged in the practice of medicine," Pfeifer said in an email to NBC News. The result, Stewart said, has been "a remarkable turnaround." He and others said Pfeifer shook up the staff, hired an administrative chief, and cut the backlog of unfiled death certificates in half. He successfully lobbied the state for $2.5 million in funding to double the number of pathologists from three to six and update equipment. With 22,000 cases a year, the current staff of three pathologists was pushed to the limit even before the tornado. When a doctor in the Tulsa office left, Pfeifer personally filled in and performed his autopsies, said Charles Curtis, deputy chief of the state Bureau of Investigations. After his deputy was bounced, he worked weekends so the office wouldn't fall behind. He refused to take an offered raise until office finances were in better shape. "He leads by example," Curtis said. When the bodies began arriving on Monday, Pfeifer said, his office was ready. "This team is accustomed to working 2-3 times [the number of] nationally recommended caseloads every single day of the year," he said in the email. "This small team here didn’t even need to be asked to step up effort toward this recent horrific task." When Ferguson went to the M.E. 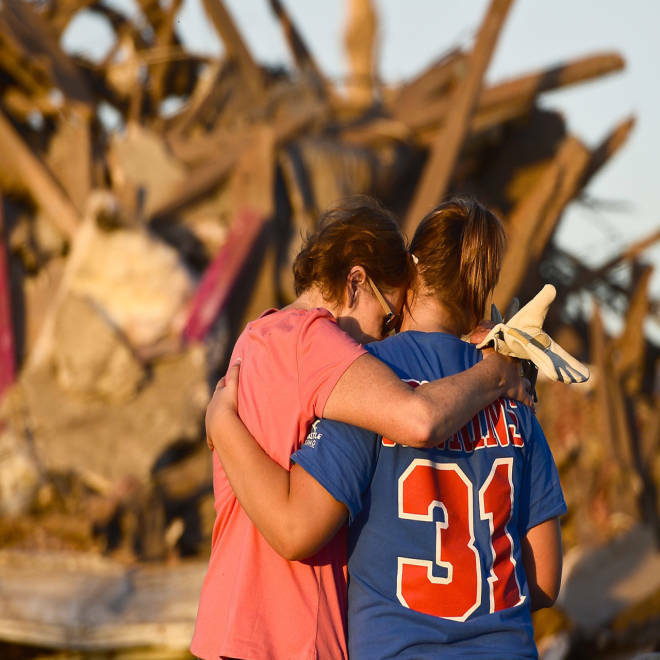 's office on Tuesday — the day the tornado death toll was revised downward from 51 to 24 after double-counting in the chaotic first hours — he couldn't talk to Pfeifer. "He was in the morgue," he said. "He's hands-on." Outside the lab, Pfeifer is a motorcycle enthusiast and a tinkerer, a welder who likes to design and build machines and who built a wood-burning brick pizza oven in his Minnesota home, colleagues said. "He's got a whole bunch of tools and stuff but it's all in storage because he can't find time to use it," Ferguson said. Ferguson said it was relief that Pfeifer was in charge when Oklahoma suffered its biggest disaster in years. He said the number and age of the victims would have been tough for any doctor, even a custodian of death, to face. "He has children around the same age as some of these victims," Ferguson said. "But I think he has the ability to set those emotions aside and get the job done."